Have you ever wished that you could customize popular sounds such as Push Notifications and Email/SMS alert sounds on your iDevice? Well if you have you will be glad to know that a new tweak was released into Cydia today (or should I say update to an already popular tweak) that allows you to easily customize almost every sound associated with your iDevice. No longer do you need to SSH into your iDevice to change sounds on your iDevice you can do it through a convenient user interface! This new tweak is called ToneFXs 2.0 and it lets you customize all the popular sounds on your iDevice. These include custom push notification alerts, custom email alerts, custom email alerts for specific contacts, custom text message alerts for specific numbers, custom calendar alerts and much more. 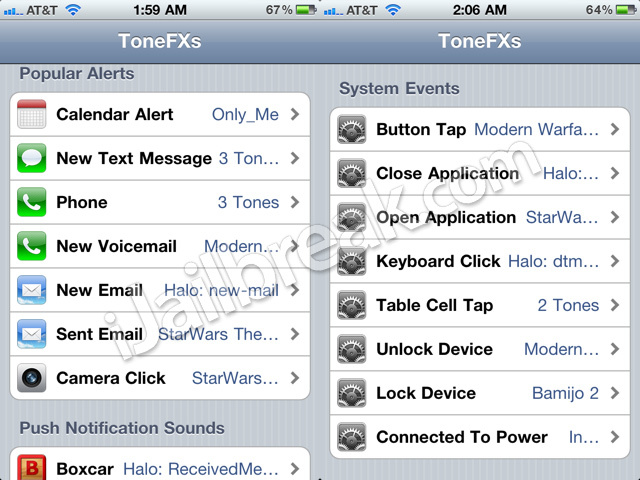 In addition, you can also shuffle multiple tones for all the alerts. It supports using any of your existing ringtones and WinterBoard Theme tones. You can also create your own tones by visiting tonefxs.com and downloading the free ToneFXsCreator. If you are interested in ToneFXs(2.0) Pro then you can find it through the Cydia Store for a price of $4.99! Which may seem like a lot, however for all the functionality you get with this tweak it is well worth the money. Let us know your thoughts on the ToneFXs (2.0) Pro tweak in the comments section below. When I try to control the ringer volume, nothing happens. The phone can be in silent mode and the ringer is still on loud. I wrote to them and not once have they return an answer, but they keep takking everyones money!!! THIS PRODUCT IS JUNK!!!!!!!!!!!!! When I set up a ring tone, it uses the ring tone in the settings AND the ringtone in ToneFXs Pro 2.0. DO NOT PURCHASE THIS PRODUCT. IT IS A SCAM!!!!!!!!!!!!!!!!! !